Kevin Michael Costner (born January 18, 1955) is an American actor, singer, musician, producer, director, and businessman. He has been nominated for three BAFTA (British Academy of Film and Television Arts) Awards, won two Academy Awards, and two Golden Globe Awards. 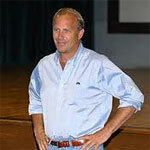 Costner&apos;s roles include Lt. John J. Dunbar in the film Dances with Wolves, Jim Garrison in JFK, Ray Kinsella in Field of Dreams, Robin Hood in Robin Hood: Prince of Thieves, Crash Davis in Bull Durham, Robert "Butch" Haynes in A Perfect World, Frank Farmer in The Bodyguard and Eliot Ness in The Untouchables. Costner also founded the band Modern West, and has performed with the band since 2007.